Fruitland is a city in Payette County, Idaho, United States. It lies along U.S. Route 95 in the Treasure Valley of southwest Idaho, about 50 miles (80 km) west of Boise and near the border with Oregon. 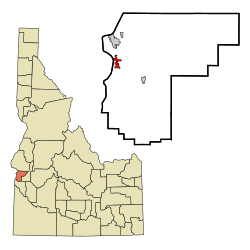 Fruitland is named after the apple orchards that surround the community, and its slogan is "The Big Apple of Idaho." As of the 2010 census, the city had a total population of 4,684, up from 3,805 in 2000. It is part of the Ontario, OR–ID Micropolitan Statistical Area. Fruitland is located at (44.016035, -116.921450), at an elevation of 2,228 feet (679 m) above sea level within the Snake River watershed. According to the United States Census Bureau, the city has a total area of 2.24 square miles (5.80 km2), of which, 2.23 square miles (5.78 km2) is land and 0.01 square miles (0.03 km2) is water. As of the census of 2010, there were 4,684 people, 1,700 households, and 1,243 families residing in the city. The population density was 2,100.4 inhabitants per square mile (811.0/km2). There were 1,836 housing units at an average density of 823.3 per square mile (317.9/km2). The racial makeup of the city was 84.0% White, 0.5% African American, 1.0% Native American, 1.1% Asian, 0.1% Pacific Islander, 10.3% from other races, and 2.8% from two or more races. Hispanic or Latino of any race were 22.6% of the population. As of the census of 2000, there were 3,805 people, 1,378 households, and 1,044 families residing in the city. The population density was 2,512.2 people per square mile (972.9/km²). There were 1,518 housing units at an average density of 1,002.2 per square mile (388.1/km²). The racial makeup of the city was 87.70% White, 0.89% Asian, 0.60% Native American, 0.05% African American, 0.03% Pacific Islander, 8.02% from other races, and 2.71% from two or more races. Hispanic or Latino of any race were 17.92% of the population. In the city, the population was spread out with 31.9% under the age of 18, 9.0% from 18 to 24, 27.6% from 25 to 44, 18.6% from 45 to 64, and 12.9% who were 65 years of age or older. The median age was 31 years. For every 100 females there were 93.8 males. For every 100 females age 18 and over, there were 87.3 males. Fruitland, Idaho Facts for Kids. Kiddle Encyclopedia.